Double X Science: Happy belated birthday, Mary Anning! Today the spotlight is turned not on a well-educated man, or a wealthy daughter with aristocratic connections, but on a girl who was amongst the poorest of the poor; who in many ways led a miserably hard and short life; who could barely read and write, and yet was someone who amazed the scientific world in the first half of the nineteenth century. 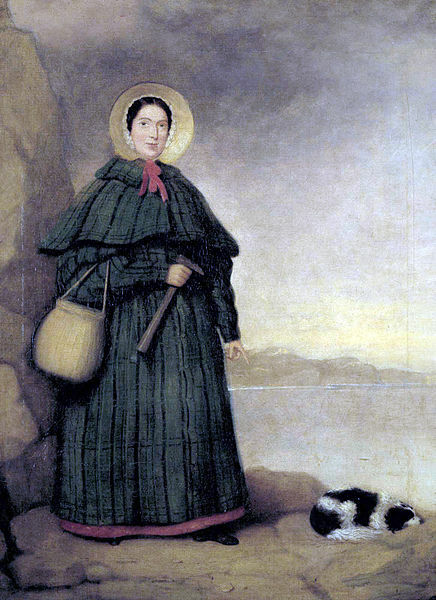 Her name was Mary Anning, born in Lyme Regis in Dorset on 21st May 1799. She cannot be said to have had an auspicious start in life. She was one of ten children – but eight died in childhood. An elder sister had already been called Mary but she had perished in a fire when her clothes were ignited from some burning wood shavings. Our heroine was born five months after this tragic death, and was named Mary in memory of her dead sibling. Mary’s parents were Dissenters, meaning that education opportunities were limited and the family were subject to legal discrimination. A member of the Congregationalist Church, she attended Sunday School and here learned the rudiments of reading and writing. The Congregational Church, unlike the Anglican Church, attached great importance to education, particularly for young girls, and she was encouraged in her development by the pastor Revd James Wheaton. Her prized possession was apparently a copy of theDissenters’ Theological Magazine and Review in which the good Reverend had apparently written two articles; one reiterated the importance of understanding that the world was created by God in seven days, and the other, somewhat curiously, suggested that a study of the new science of geology was to be encouraged. Father was a carpenter and cabinet maker and business was tough. Even worse, her father died when Mary was eleven, leaving the family without any apparent means of support. After the father’s death the destitute family eked a living finding fossils along what is now termed the Jurassic coast in Dorset. In 1811 Mary’s elder brother Joseph found a fossilized skull of what was thought to be a crocodile protruding from the crumbling cliffs of Blue Lias. Mary was given the task of slowly exposing the ancient creature, uncovering not just the skull but 60 vertebrae. It was difficult work, scrambling to reach the exposed rock face, at risk from the tides and rock falls, but the young girl showed an aptitude for the work. Besides, there were rewards: the skeleton was bought by the local Lord of the Manor called Henry Hoste Henley for £23. He in turn sold it to a private collector called William Bullock, and he exhibited it in London with the rest of his fossil collection in his Museum of Natural Curiosities. In 1819 it was bought as a ‘crocodile in a fossil state’ by the British Museum, for £45. The creature was eventually called Ichthyosaurus (‘fish lizard’) by the scientists Henry de la Beche and William Conybeare. It was the first specimen of Ichthyosaurus ever recorded, and both men went on to make their name on the back of Mary’s efforts. The find was to change Mary’s life and, in time, her studies of anatomy, geology, paleontology and scientific illustration were to propel her to considerable fame (but never fortune). The world of scientific discovery was not just dominated by men, it was dominated by Anglicans, people of good education and usually privilege. An ill-educated, impecunious, girl from her background was never going to find acceptance easy. She did however have supporters. Her big break came in 1820. Lieutenant-Colonel Thomas James Birch had previously got to know Mary and her brother Joseph and had bought a number of items from them. He decided to auction off some of these specimens and the sale generated huge interest from all over the country and indeed throughout Europe. The specimens were sold for £400, a huge sum at the time, and the generous Lieutenant-Colonel handed the entire proceeds over to Mary. In time she became the focus of attention – not just collectors and scientists would visit her tiny beach-front shop, but also socialites keen to see and speak with this witty, knowledgeable but poorly-educated woman. Throughout the 1820’s and 30’s she hammered away, discovering the long-necked plesiosaurus or sea dragon in 1823, a ‘flying dragon’ i.e. the pterodactyl (in 1828) and hundreds, upon hundreds of other fossils. Squaloraia a cross between a shark and a ray, was discovered in 1829. In the winter of 1830, she found a new, large-headed Plesiosaurus, and sold it for £210. She became an expert on the delightful subject of bezoar stones (now known as coprolites, that is to say, fossilised faeces!). She also proved that belemnite fossils contained fossilised ink sacs, by grinding up the fossilised remains and mixing them with water to produce an inky substance similar to sepia ink in squids. Her brother Joseph demonstrated this with his drawing of one of Mary´s fossils, shown here. She helped show the astonished world what marine life looked like in the Jurassic period, some 140 to 200 million years ago, before mammals ruled the earth. Scientists such as Henry de la Beche helped her financially when he handed to her the proceeds of sale from his engraving entitled Duria Antiquior, a more ancient Dorset – a scene of prehistoric life based upon fossils which she had found and identified. Ah, so that was it: Divine favour, not skill and hard work …. For years she carried on chipping away at rocks with her hammer, accompanied by her faithful dog Troy, who always appears beside her in paintings of the day. Eventually in 1833 Troy was killed in a rock-fall when the tide undermined the ledge he was standing on, but Mary was unharmed. She was however distraught at the loss of her constant companion. She knew only too well the irony that it was the really high tides in winter which revealed the fossil deposits, just as it was the same tides which made the rock face unstable and liable to collapse. Hers was not to be a long and happy life. She died of breast cancer at the age of 47 on 9th March 1847. In her lifetime success and recognition evaded her. She had been barred from admission to the Geological Society on account of her gender (women were not admitted to their ranks until 1904). At one stage she wrote “The world has used me so unkindly, I fear it has made me suspicious of everyone” and only one journal ever published anything from her – and that a letter to the editor, not an article. And one, only one, other geologist named a specimen after her in her lifetime, when the Swiss-American naturalist Louis Agassiz named two fossil fish after her, Acrodus anningiae and Belenstomus anningiae. The gravestone marking where Mary & her brother are buried. In fairness to the Geographical Society they did help her financially through her final illness. She was buried in St Michael’s Church in Lyme Regis. Finally, more than a hundred and fifty years after she died, the Royal Society included her in their 2010 list of the ten British women who have most influenced the history of science. Some might say: better late than never. Many happy returns of the day, Mary! Post script: I particularly enjoyed doing this post because my ancestor Richard Hall was an avid fossil collector. I still have some of the items he collected along with his booklet of fossil drawings. I especially liked the way that he believed that the ammonites were actually long worms, curled up in death, with their mouths in the centre of the spiral, turned to stone. More details appear in The Journal of a Georgian Gentleman. We've read about her in my son's dinosaur books! I didn't know about the lightning though.... eek.